A parent cooperative is a school that is owned by the families. Parents play an important role in helping to support and manage the program. A cooperative is unlike a standard preschool or daycare setting because it incorporates and benefits the whole family; parents are part of a community of many first-time parents and are able both to support other parents and feel supported and involved in their child's first school experience. 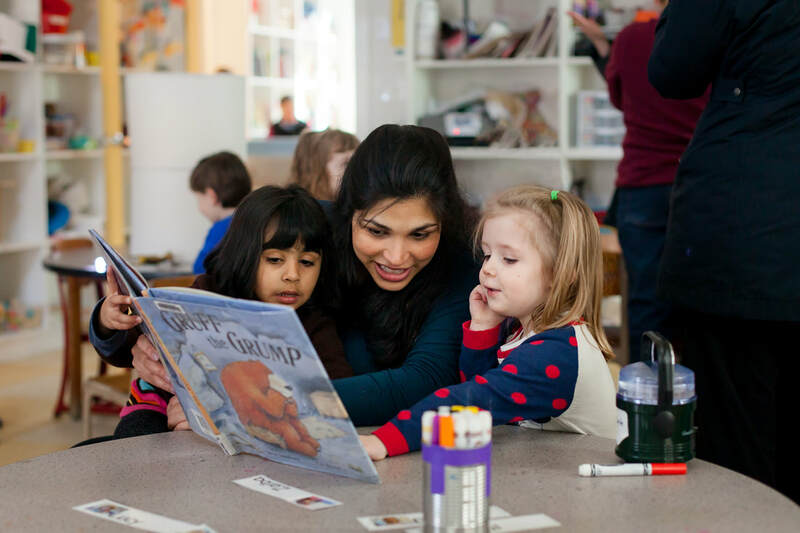 When your child attends Cambridge Nursery School, your family gains a community of supportive parents and professionals. At CNS, we are committed to building a sense of community among parents and families. When parents are involved in their child’s early school program, they have many opportunities to observe their child’s friends, recognize that other children may show some of the behaviors that they thought were particular to their own child, and see how teachers help children to manage specific behaviors. Similarly children become comfortable with and develop special and trusting relationships with other adults. Many families at CNS have stayed close with the families of their child’s friends over the years. Younger siblings also have an easier transition when it is their turn to attend the program. Can my family manage it? Yes! The parental responsibilities are important, but not burdensome. As a community we are committed to flexibility and are determined to help families participate in the ways best suited to them. Different families have different levels of availability and we welcome all. The minimum required parental responsibilities include holding a parent job, parent helper days (9am-12noon, about 10 days per school year), parent meetings (3 evenings per year), and parent work days (2 Saturdays per year). Parent jobs range from time intensive, such as being a board officer, to seasonal, such as raking leaves or organizing our parent helping schedule. Additional roles are available and we encourage parents to participate as much as they want. Parents play an important role at Cambridge Nursery School. In a cooperative, parents bring their enthusiasm, skills and energy to support the teachers and children. We seek to enroll families who want to play an active role in their children's preschool program. Parent Helping - Parents who choose a cooperative preschool do so in part because of the opportunity to spend time in their child’s classroom. CNS parents report how satisfying it is to play an active and integral role in their child’s preschool experience: to see their child grow and develop, to watch as they become increasingly confident in relationships with both their teachers and other children, to see them take more risks within the group, and to get to know their friends. Each family works in their child's classroom approximately 10 mornings per year per child. Parent Work Days - Parents take part in a fall and spring Work Day to help with building maintenance. Parent Meetings - Occasional meetings are held in the evenings (3-5 meetings/ year). School Events - Families are asked to help publicize school events. Some families also volunteer at the event. Parent Board - (Optional) Families are welcome to join the Parent Board and take a more active role at CNS. Since the school operates as a co-op, I have the opportunity to help in my daughter's classroom approximately once a month, which has allowed me to get to know her classmates and teachers so much better and observe all the friendships developing at the school. I am consistently amazed by the thoughtful and gentle ways that the teachers find to help the children navigate their emotions and the complex social interactions with peers and adults."